Smoke Assassin Review: Does Smoke Assassin Work to Help Stop Smoking? Smoking is a habit that comes with a lot of downsides. Aside from the obvious health risks, there is also the expense of smoking to consider. Additionally, smoking leaves an unpleasant smell in the hair and clothes. On top of that, smoking is not allowed in many locations, leaving smokers standing in the cold for a smoke. For these reasons, many people are struggling to quit smoking and are turning to electronic cigarette products like Smoke Assassin to deal with this difficult task. 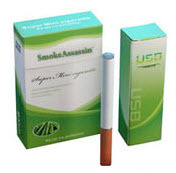 Smoke Assassin is an electronic cigarette alternative designed to break the addiction to nicotine and habit of smoking. Smoke Assassin claims to help to break the oral fixation aspect of the cigarette addiction with a smokeless water vapor system intended to break the habit of lighting up and smoking cigarettes. Smoke Assassin is a realistic cigarette replacement that works on a water vapor system. Smoke Assassin is comprised of a battery, atomizer and inhaler which contains replaceable cartridges loaded with tobacco flavor. The entire package very closely resembles an actual cigarette, right down to a glowing tip to indicate that the system is on. Each Smoke Assassin cartridge lasts for about the same amount of time as a pack and a half of cigarettes. The Smoke Assassin cartridges contain no actual tobacco, nicotine or chemicals, but instead just the flavor of a cigarette. While many would be quick to point out that smoking itself is not an inexpensive habit, Smoke Assassin does not come cheaply, either. Smoke Assassin can be ordered online and comes with a 30 day satisfaction guarantee. A premium starter pack of Smoke Assassin contains four Smoke Assassin cartridges as well as USB chargers and is available at a cost of $160 plus shipping and handling. At the current cost of cigarettes, this is more than the cost of actual smoking for even the heaviest smokers, eliminating the argument that electronic cigarettes save money. Additionally, replacement cartridges are sold at a cost of twenty for $70 or forty for $100, again plus shipping and handling charges. Is Smoke Assassin effective to stop smoking? Electronic cigarettes like Smoke Assassin may seem like an attractive option for those who feel like they have already tried everything to quit smoking. However, the drawbacks of electronic cigarettes like Smoke Assassin are almost always overlooked. For example, switching from cigarettes to Smoke Assassin is the equivalent of going cold turkey on cigarette smoking, as Smoke Assassin contains no actual nicotine. Many people are turning to Smoke Assassin because cold turkey has proven to be too difficult, setting them up for disappointment and discouragement. Smoke Assassin claims to break the oral fixation or physical habit of smoking. However, the electronic cigarette that is Smoke Assassin merely replaces the habit of smoking an actual cigarette with smoking a fake cigarette. The addition to nicotine may be broker, but the hard to break physical habit will remain. Not to be overlooked is that fact that Smoke Assassin contains many small, electronic parts which are easy to lose and even more easy to break. Many will find that a single month of using Smoke Assassin is not effective in completely breaking the habit of smoking and find themselves out a significant amount of money when the relatively short guarantee expires. Quitting smoking is an extremely difficult task. Unfortunately for those looking for an answer, an electronic cigarette like Smoke Assassin often ends up being much more trouble than its effectiveness is actually worth. The Smoke Assassin program is interesting in its concept but fails utterly in execution. First of all, the program costs more than smoking cigarettes. This is absurd considering the sheer number of effective stop smoking products and programs that are significantly less expensive. Secondly, the Smoke Assassin program doesn't address the issue of nicotine addiction. Because it doesn't provide the smoker with nicotine, nor does it replace the nicotine with an alternative, the Smoke Assassin program is virtually the same as going cold turkey (which has a high failure rate, reported at 70%-90% failure. For these reasons, the Smoke Assassin system is not recommended. As an alternative, we suggest herbal stop smoking products that contain natural ingredients to help manage nicotine cravings while you're quitting. These products have a much higher success rate than the modified-cold-turkey system outlined above. Learn more.